Fusion of cervical spine in kyphotic alignment has been proven to produce an acceleration of degenerative changes at adjacent levels. Stand-alone cages are reported to have a relatively high incidence of implant subsidence with secondary kyphotic deformity. This malalignment may theoretically lead to adjacent segment disease in the long term. 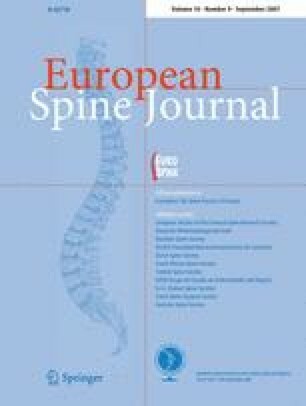 The prospective study analysed possible risk factors leading to cage subsidence with resulting sagittal malalignment of cervical spine. Radiographic data of 100 consecutive patients with compressive radiculo-/myelopathy due to degenerative disc prolapse or osteophyte formation were prospectively collected in those who were treated by anterior cervical discectomy and implantation of single type interbody fusion cage. One hundred and forty four implants were inserted altogether at one or two levels as stand-alone cervical spacers without any bone graft or graft substitute. All patients underwent standard anterior cervical discectomy and the interbody implants were placed under fluoroscopy guidance. Plain radiographs were obtained on postoperative days one and three to verify position of the implant. Clinical and radiographic follow-up data were obtained at 6 weeks, 3 and 6 months and than annually in outpatient clinic. Radiographs were evaluated with respect to existing subsidence of implants. Subsidence was defined as more than 2 mm reduction in segmental height due to implant migration into the adjacent end-plates. Groups of subsided and non-subsided implants were statistically compared with respect to spacer distance to the anterior rim of vertebral body, spacer versus end-plate surface ratio, amount of bone removed from adjacent vertebral bodies during decompression and pre- versus immediate postoperative intervertebral space height ratio. There were 18 (18%) patients with 19 (13.2%) subsided cages in total. No patients experienced any symptoms. At 2 years, there was no radiographic evidence of accelerated adjacent segment degeneration. All cases of subsidence occurred at the anterior portion of the implant: 17 cases into the inferior vertebra, 1 into the superior and 1 into both vertebral bodies. In most cases, the process of implant settling started during the perioperative period and its progression did not exceed three postoperative months. There was an 8.7° average loss of segmental lordosis (measured by Cobb angle). Average distance of subsided intervertebral implants from anterior vertebral rim was found to be 2.59 mm, while that of non-subsided was only 0.82 mm (P < 0.001). Spacer versus end-plate surface ratio was significantly smaller in subsided implants (P < 0.001). Ratio of pre- and immediate postoperative height of the intervertebral space did not show significant difference between the two groups (i.e. subsided cages were not in overdistracted segments). Similarly, comparison of pre- and postoperative amount of bone mass in both adjacent vertebral bodies did not show a significant difference. Appropriate implant selection and placement appear to be the key factors influencing cage subsidence and secondary kyphotisation of box-shaped, stand-alone cages in anterior cervical discectomy and fusion. Mechanical support of the implant by cortical bone of the anterior osteophyte and maximal cage to end-plate surface ratio seem to be crucial in the prevention of postoperative loss of lordosis. Our results were not able to reflect the importance of end-plate integrity maintenance; the authors would, however, caution against mechanical end-plate damage. Intraoperative overdistraction was not shown to be a significant risk factor in this study. The significance of implant subsidence in acceleration of degenerative changes in adjacent segments remains to be evaluated during a longer follow-up.